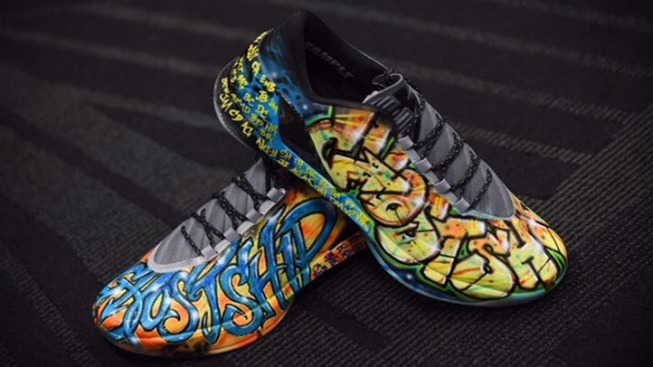 Golden State Warriors All Star and reigning two-time NBA MVP Stephen Curry on Thursday night laced up a special pair of sneakers to honor the creative souls who died in this month's Oakland warehouse fire. The shoes, designed by two artists themselves in the Maryland area, had each of the 36 victims' names etched in paint. "It was bittersweet," said David Zambrano of Dez Customz, who along with his partner, Mohammed Gafar, designed the Under Armour sneakers for Curry. "We loved the opportunity, but we hate that it occurred. It could have been us if we had lived in the Bay Area. They lost themselves being creative. Three dozen people." The duo was asked by Under Armour to create the shoes after Curry told his sponsor company that he wanted to do something to honor the artists and musicians lost in the Dec. 2 blaze at an electronic dance party at the Ghost Ship warehouse. They will be auctioned off for Oakland Fire Relief. Late Thursday, the YouCaring fundraising website shows organizers were nearing their $500,000 goal. Warriors spokeswoman Lisa Goodwin said Friday that the sneakers have not yet been auctioned off, adding that she hoped the auction would go live in a few days. Zambrano and his partner designed both a pre-game and a more formal, NBA-approved end-game pair of sneakers that are painted in bright yellows, blues and oranges and look like a mural on a city street. The Warriors players and coaches have pledged $75,000 to ongoing relief efforts. The money is in addition to $50,000 the Warriors organization donated after the tragedy. Meanwhile, federal investigators completed their investigation of the Ghost Ship warehouse fire and turned their evidence over to the Oakland Fire Department. How the blaze started and who might be held responsible for it have not yet been determined.